Create professional documents in minutes with GBC binding products. From economical, occasional use to high tech, everyday use, there is a GBC binding machine to suit any office or home binding requirement. 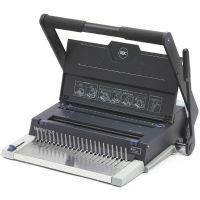 � Punches 30 x 80gsm sheets with the 4 hole punch option. � Comb and Wire Size Selector with margin depth selector.